Would you like to attract tui to your garden? This is a very easy thing to do – simply plant trees that tui feed on. Tui like to feed on nectar. However, tui will not feed on just any plant that produces nectar. 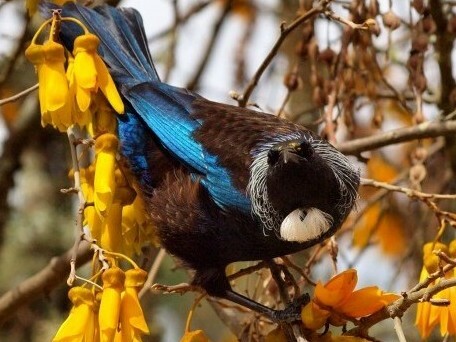 The flowers must be the right type and shape for the tui to feed from. Over the next few weeks I will introduce several trees and plants that will attract tui into your garden. 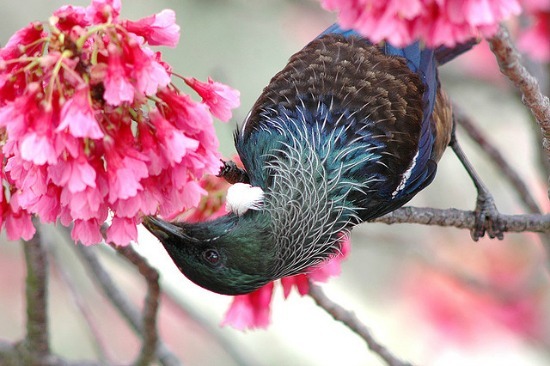 This week I would like to introduce one fantastic tui feeding tree – the Taiwanese cherry, or Prunus campanulata. A qualified arborist (tree surgeon) can easily prune the Taiwanese cherry to have an upright, vase shaped canopy. (Tree pruning is always best carried out by a qualified arborist). 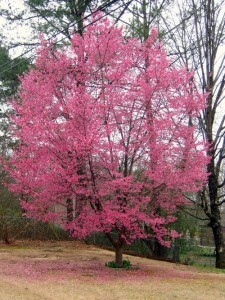 This makes it the perfect tree for planting in a garden where there is very little room to spread out. There are many different cultivars of different sizes and also different shades of pink for the flowers. 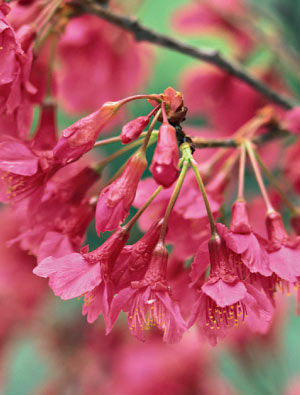 The Taiwanese cherry has beautiful and distinctive bell-shaped flowers, quite different in shape from the other flowering Cherries. They hang downwards and are about 3cm in size. The flowers are deep pink in colour and smother the branches from early spring, hanging in drooping clusters. 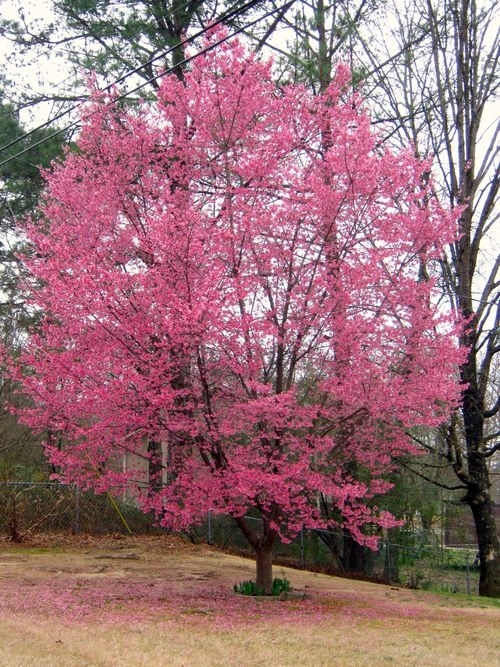 The flowers appear before the leaves, so the trees are a striking mass of unbroken pink. 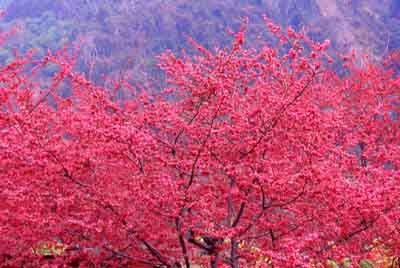 Compared to the Japanese cherries, the Taiwanese cherry flowers early in the season while the Japanese are still dormant. The Japanese cherries flower much later. Important: Don’t think you can plant a Japanese Cherry tree to attract the Tuis! Japanese cherry flowers are a very different shape and are not pollinated by birds. Tui do not feed on Japanese cherries. Felix Jury – has a small pyramidal shape. The flowers are larger, and carmine red in colour. Okame – is a more compact upright tree. 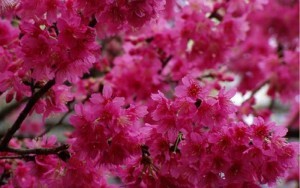 Flowers are carmine pink in colour. The foliage of this cherry turns brilliant orange in autumn. A good tree for small gardens. Superba – the brightest coloured and earliest blooming of all the cherries, with masses of claret red flowers covering the branches. A vase shaped tree with the foliage turning bronze in autumn.